IBM DemandTec needed a striking look for their Demandbetter 2012 conference, and John Murray Productions, Inc. collaborated with the Big Picture for the second year in a row to provide a dynamic look fitting the needs of the cloud based marketing solutions company. 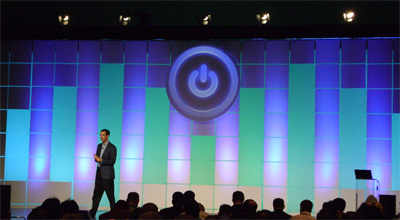 Working with a 'Get Connected' theme, we created a checkerboard like set, using graphic elements from the companies brand imaging while utilizing color changing lights to change the feel of the set throughout the conference. 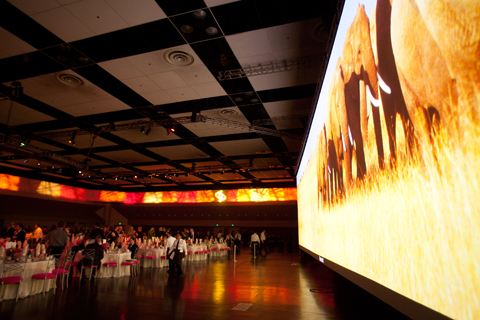 The 2011 Professional BusinessWomen of California’s 22nd Annual Conference was held this Spring at the Moscone Center in San Francisco, and John Murray Productions, Inc. worked with E2K Event Management to design and install the successful event. The attendees included over 3,400 business women across all levels and industries who brought to life our the theme of the event: Connect, Explore, Inspire. The message was reinforced with three large format prints suspended in front of a 24' x 70' drapewall and flanked by our customized, back-lit GLO walls inspired by the event. The backlit GLO Curves compliment our line of GLO scenery and are now available to rent. 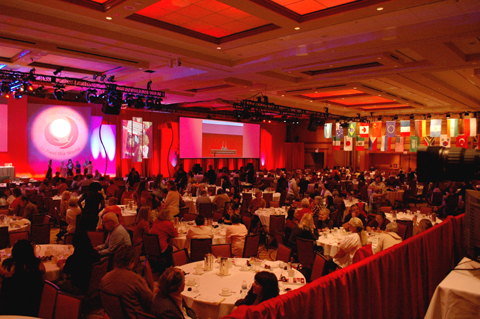 Two 15' x 20' screens combined with creative lighting effects provided by Impact Lighting completed the look of the annual event. OSIsoft held their Users Conference this March at the San Francisco Hilton, and John Murray Productions, Inc. worked with Fernbacher Productions to create the look for the annual meeting. Utilizing our large format printer to custom color the tiles, our 2x2 tile set created a clean and modern look for the data management company. 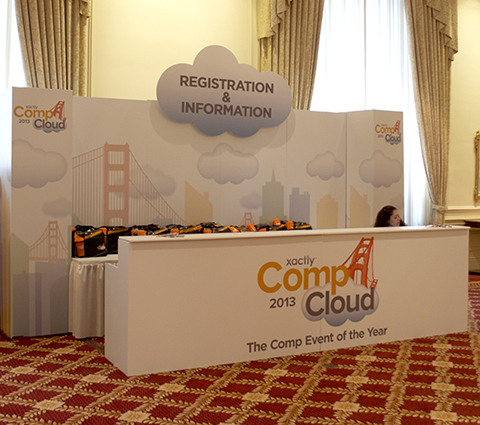 We also used our W lectern with a custom graphic panel featuring the event logo. The tiles, which are rigged off of a 16' x 30' truss arch, are hung in front of a 18' x 32' cyclorama which was uplit with colored lights, allowing a dynamic look for the event. The 2010 California Democratic Convention was held at the Los Angeles Convention center this year, and John Murray Productions, Inc. worked with MetroMedia Productions to create the look for the event. 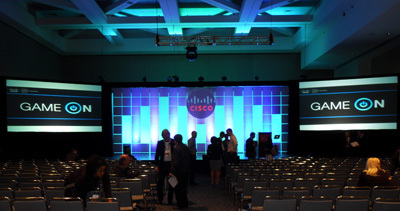 The scenic production included custom fabricated table and screen surrounds, branded dimensional signage, and drapery. 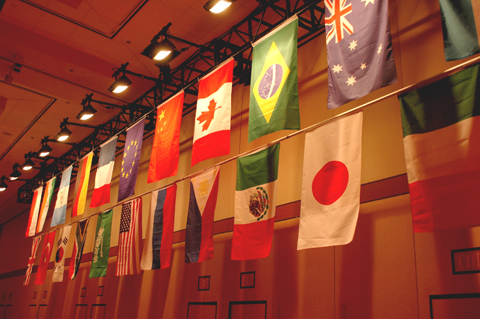 The convention was a huge success, and the client very happy. We look forward to working with them again next year on the annual convention.